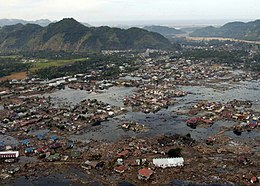 The 2004 Indian Ocean yirdquauk occurred at 00:58:53 UTC on 26 December wi an epicentre off the wast coast o Sumatra, Indonesie. ↑ 1.0 1.1 1.2 1.3 "Magnitude 9.1 – OFF THE WEST COAST OF NORTHERN SUMATRA". U.S. Geological Survey. Retrieved 26 August 2012. ↑ If the daith toll in Myanmar wis 400–600 as claimed bi dissident groups there, rather than just 61 or 90, mair nor 230,000 fowk would hae perished in tot frae the tsunami. ↑ "Indonesia quake toll jumps again". BBC News. 2005-01-25. Retrieved 2012-12-24. Wikimedia Commons haes media relatit tae 2004 Indian Ocean tsunami. This page wis last eeditit on 4 Januar 2017, at 01:29.